Bruma Caverns is a small cave west of Bruma containing animals (quest-related). It contains only one zone, Bruma Caverns. The Caverns provide a secret passage into Bruma through Jearl's Basement. 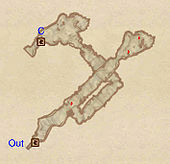 This location's map marker (M on map) is named Bruma Caverns (editor name BrumaCavernMapMarker). The entrance door is ENE of the marker, 40 feet away. Being a very small cave with only nuisance animals and lacking in terms of loot or valuables, it is fairly unremarkable. 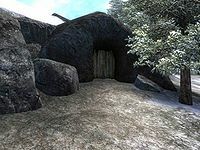 It does provide a secret entrance into Bruma through Jearl's house; which can be useful if you are trying to evade the guards. 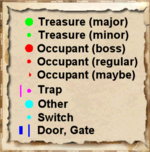 The door to Jearl's basement, however, is locked with a leveled lock, so either a spell or lockpicks are required. A key does exist, but is not available until the initiation of the Spies quest, at which it can be obtained from Jearl or her companion, Saveri Faram.